The US government has published a letter sent to First Minister Alex Salmond before the release of the Lockerbie bomber. Abdelbaset Ali al-Megrahi was convicted of murdering 270 people in 1988, and was freed on compassionate grounds last year because he is terminally ill. It was claimed the US told Mr Salmond compassionate release was "preferable" to a transfer to a Libyan jail. The letter confirmed this but it called for him to stay in Scotland if freed. It said: "The US is not prepared to support Megrahi's release on compassionate release or bail. "Nevertheless if Scottish authorities come to the conclusion that Megrahi must be released from Scottish custody, the US position is that conditional release on compassionate grounds would be a far preferable alternative to prisoner transfer, which we strongly oppose." The letter from August 2009 laid out two conditions which were important to the US administration and would "partially mitigate" the concerns of the 189 American victims' families. 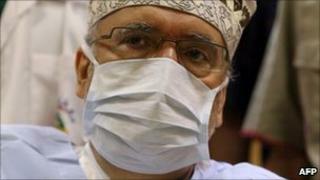 It said: "The United States would strongly oppose any release that would permit Megrahi to travel outside Scotland. "We believe the welcoming reception that Megrahi might receive if he is permitted to travel abroad would be extremely inappropriate given Megrahi's conviction for a heinous crime that continues to have a deep and profound impact on so many. "As such, compassionate release or bail should be conditioned on Megrahi remaining in Scotland." Welcoming the letter's publication, a Scottish government spokesman said: "Along with providing full information to the Senate committee on foreign relations, this position has been an important part of the Scottish government's co-operation and constructive engagement with the committee." It comes after Mr Salmond told a US senate committee they "may wish to pursue" Barack Obama's administration to get inter-governmental correspondence published relating to the bomber's release. Mr Salmond directed the US Senate Committee on Foreign Relations to Scottish government documents published online but said it could not breach the long-standing practice of holding in confidence government-to-government communications, by publishing other material without the permission of the US government. Committee member Senator Robert Menendez had also requested any Scottish government documents "relating to BP's negotiations for or interest in oil exploration in Libya". The first minister stated in his reply to Mr Menendez: "There are no such documents." The Committee on Foreign Relations hearing on Thursday will examine the release, but invitations to give evidence to Mr Salmond, his Justice Secretary Kenny MacAskill - who made the decision - and the former UK Foreign Secretary Jack Straw have been turned down. The option of Megrahi remaining in Scotland after compassionate release had been rejected by Mr MacAskill at the time on the grounds of security and cost.